Shop | Peak Performance: A realistic approach to nutrition. Overlooking your nutrition as a musician is one of the biggest mistakes you could possibly make. The effects of nutrition and hydration can impact you both physically and mentally, and key nutrients play a key role. Nutrition for Musicians is specifically designed for musicians to help maintain and advance their careers. Nutrition for musicians is for all levels of performers to understand both the impact nutrition and hydration has on your body and mind, as well as the science behind it. This program teaches you about all the essential nutrients, and how to improve energy, strength, and prevent soreness for improved performances and recovery night after night. In this program, you will have access to quick fixes for digestive issues that may have prohibited you from performing well in the past. I’ve made changes as simple as, changing the type of fiber a performer eats pre-show and have seen incredible results come performance time. Simple and easy pre-show or performance foods not only provide energy but help you to think more clearly leading to better reflex timing. And post-performance re-fueling food will help maintain your talents by preventing inflammation, muscle, and joint soreness. 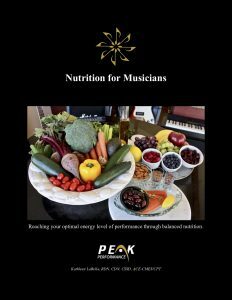 Nutrition for Musicians is more than a nutrition class, it provides expert advice and education on all nutrient requirements, and specifically tailored for performers to keep you playing longer and more importantly help you reach your full potential. The com plete package. All videos (2 hours 38.5 minutes) and the eBook to the series, including those not sold separately. The eBook provides further in-depth details on all nutrients, and detailed examples of eating out while traveling, menus, and tips on maintaining weight or ways to set goals for changing weight. You will understand the role and importance of essential nutrients for life that include carbohydrate, fat, protein, vitamins, minerals, and water, as well as details on antioxidants and phytochemicals (plant chemicals). You will have a better understanding of the biomechanics and body mechanics used while performing, and how nutrition affects the body from muscle soreness and tissue breakdown to dehydration and the vocal cords. Bonus videos include an additional 49:09 minutes of video explaining vitamins, minerals, antioxidants, and phytochemicals, and how to obtain them from food, and the initial introduction video is included. The eBook provides further outlined details on each nutrient including a detailed outline of food sources, as well as deficiencies, and side effects of consuming too much in supplement form. The eBook also explains phytochemical food sources, health benefits, and reducing cell damage. Total video time: 2:38:35. Regular Price $179.00 Now on sale for $149.00. The eBook may also be purchased separately at the bottom of this page. Special Proceeds: We must nourish both the mind and body. When I was developing Nutrition for Musicians, I wanted to give something back to the community. While food nourishes us, music and playing music has positive therapeutic effects on the brain and mood. Five percent of all proceeds from Nutrition for Musicians will be donated to Hungry for Music. The eBook provides further in-depth details on all nutrients. 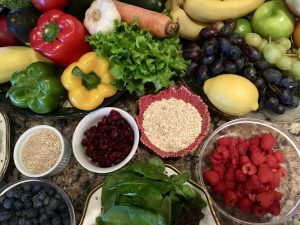 You will understand the role and importance of essential nutrients for life that include carbohydrate, fat, protein, vitamins, minerals, and water, as well as details on antioxidants and phytochemicals (plant chemicals). Detailed examples of eating out while traveling, menus, and tips on maintaining weight or ways to set goals for changing weight. You will have a better understanding of the biomechanics and body mechanics used while performing, and how nutrition affects the body from muscle soreness and tissue breakdown to dehydration and the vocal cords. Price $32.00 USD. Most insurance covers 100% for prevention – please contact Kathy LaBella first to find out more, or to combine insurance with ongoing added sessions. In-person, teleconference or telephone – Please call about insurance coverage. Education on eating food that provides vitamins, minerals, fiber, antioxidants, and phytochemicals specific to your needs. Discuss fitness guidelines as time allows with or pick and choose what you want to discuss during your session. Elite Nutrition Package: 20 Weeks of unlimited sessions! Receive the Designer Nutrition package, only more than double the amount inside twenty weeks! Includes discussing fitness guidelines and strategies that work for you. This is ideal for extra phone conference time in-between long sessions. Extra sessions by appointment only include unlimited 15-60-minute sessions 1, 2 or 3 times per week for the twenty weeks. This allows you to schedule a check-in anytime you feel you need some extra help, guidance, diet or fitness strategy or if you have basic nutrition questions. – Please call about insurance coverage.